A car seat is an essential piece of kit for the growing family. The fact is, normal car seats and seat belts are not ergonomically designed for children, and while they may suffice temporarily, they will in all likelihood be shown up in the event of a serious crash. Every item on this is backed up by reviews from customers who have tested these convertible car seats themselves in hazardous conditions. A convertible car seat is one which can be used in a rear-facing manner in the early stages of your child’s growth, before being converted into a front-facing seat when the child grows so large that extra legroom is required. Many also have the option of being used as a booster seat after your child outgrows the seat’s original dimensions. For the first time buyer, trying to select an appropriate car seat can be tough. There are a number of different features that a buyer might want to prioritize, and different car seats focus on different things. From steel-reinforced shells to side-impact protection, to energy absorbing foam; there are a number of standards against which you could judge a good car seat. Once safety is catered for, useful extras like foldability and machine washable fabrics also contribute to the usefulness of a convertible car seat. Read ahead to survey the ten best convertible car seats currently on the market. This model comes with a wide range of recliner and extender options, easy-latch buckles and 5-point harness positions. The seat has been subjected to strenuous impact tests, and is side-impact tested for infant retention. In less technical language, that means that if your car crashes, your child won’t slip out the side of the car seat. Recommended for rear-facing up to age 2, or at weights below 50lbs. At the bottom of this car seat there’s an adjustable panel which can be pulled out to provide a recliner-style extender, allowing your child’s legs to rest rather than hang. The extra leg room provided by the extender also lengthens the rear-facing period, before eventually running out of space as your child grows. Comes with a 6-position recline option, along with a 10-position headrest. Combined with the 5-point harness system, this makes the seat an extremely adaptable car seat which can accomodate a fast-growing kid. This seat comes with a strong manufacturer reputation and this is reflected in the price. While not the most expensive on this list, the seat comes in at slightly above the average. Not a budget model, but still available at an approachable price. This is an American made, sturdy, adjustable seat with a generous array of useful safety features. The Evenflo comes with multiple harness positions, easy buckle release, a removable head pillow, and is available in a range of trendy colours. This model is extremely sturdy and structurally sound, and it has survived crash tests impacts at energy levels 2x the Federal standard, while also being side-tested to industry standards. 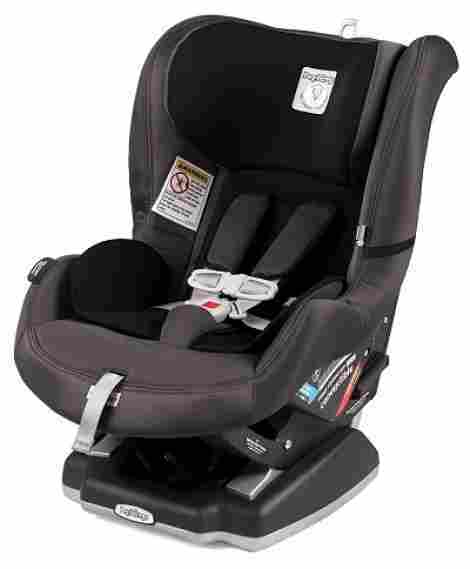 Any reputable car seat vendor must subject their product to impact testing against a Federal standard. This seat has been subjected to impacts at approximately double the recommended standard, and still holds up. It has also passed rigorous side-impact tests. The seat comes with four different sets of slits for shoulder harnesses, allowing the seat to adapt to a growing child. Meanwhile the leg harnesses have two different sets of slits for use, enabling adjustable tightness options. This seat comes in at a very competitive price that should be affordable for even the casual shopper. The price does vary for different colours, so be sure of what you’re getting. This seat also comes with a free return policy; adding a layer of security to your purchase. This seat lives up to its name, as it provides ample room for your child to grow without having to replace your car seat after 6 months. It comes with industry standard side-impact testing, and a Quick Fit harness which adjusts everything from one position. Capable of holding children up to 65lbs, the seat can also transition into a booster for when your child is ready to move to real car seats. A simple but effective feature - harness will stay where you want them without falling behind the unit or getting tangled up around your child. Harness holders keep the harnesses in place and make them easily accessible. The Quick Fit harness allows the entire structure to be loosened or tightened from one easy vantage point. Meanwhile the addition of two cup holders, one on each side, is a useful feature. The seat has a mid-range price reflective of its reputation. Watch out for discount deals from Safety 1st, while free returns and 2-3 year protection plans are also available. The seat lives up to its mid-range price. 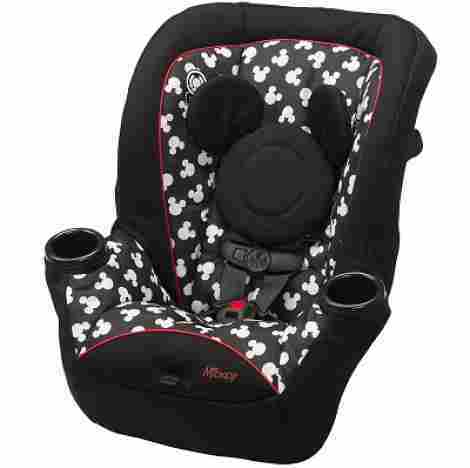 This car seat is an easy-to-install, adjustable, stylish option with a distinct Mickey Mouse polkadot style pattern, and is suitable for infants up to 40lbs. The car seat has been tested to Federal crash test standards, as well as side-impact testing. It also comes with a cup-holder on each side, and its harnesses can be adjusted with 5-point harness position options. The seat comes with a easy-equip latch function which can be clipped on to your car in one easy movement. The easy-installation also makes it suitable for airplane seats. The Mickey Mouse silhouette pattern comes in the option of black+white, making it suitable for children of either gender. Low-key but identifiable design makes for a unique car-seat. Will be more suitable for some kids than others. The seat currently retails for a price that’s comparable to budget car seats. Its price varies ever so slightly depending on the colour chosen, with seven different colours to choose from. A well-designed car seat which comes in at a budget price. This car seat is a premium option which weighs in at 24lbs and comes with a range of safety features while including a bit of luxury. There are too many to list here, but, plush foam padding, an energy absorbing base, steel-frame reinforcement, foam-lined sides, and seven recline positions, are just some of this model’s features. Also comes with a 14-position adjustable harness. The seat’s features justify its large size and weight. The seat is built with safety in mind, and features a steel-frame with an energy absorbing base. The seat belt itself is made from sturdy impact-absorbing material with stage-release stitches which slow movement in the event of a crash. Getting a car seat set up, in position and secured is often the most cumbersome part of the process, but with this brand's patented ClickTight technology the Boulevard can be installed with just one click. This tether is also made in a slight V-shape; this is to prevent your child from turning in the seat when driving. This model doesn’t scrimp on its safety or its luxury features. 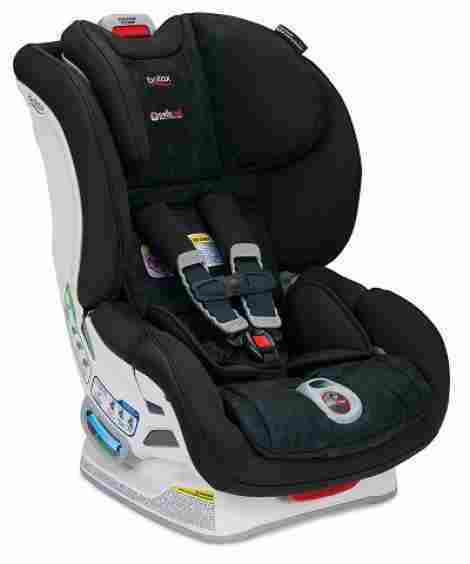 Britax is an established name in the industry and their seats are priced in the upper range. A larger initial outlay is comfortably gained back in the years of quality use you’ll get out of it. This car seat is high-end option with a good selection of unique features and utilities. The seat uses the FlexTech system, which allows the seat to respond to crashes from all directions. The fabric is made from a self-wicking, naturally deodorizing material. 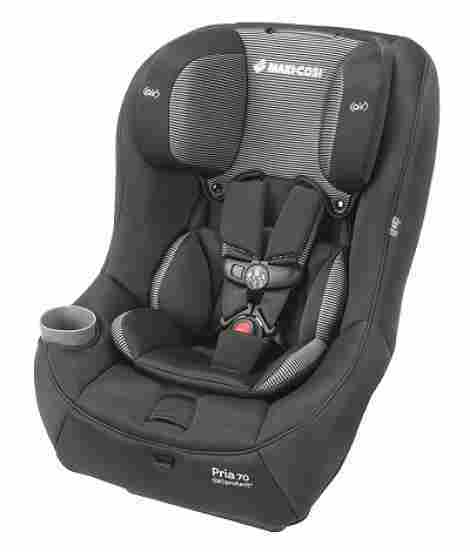 Also comes with premium seat-padding, and Maxi-Cosi’s Air Protect system for extra side-impact protection. The seat is designed with multi-directional crashes in mind, not just front or rear. The FLexTech technology employed by this brand allows the shell of the seat to respond to impacts from either side, while the Air Protect system adds a layer of air between the construction levels, allowing for even more impact absorption. The padding and fabrics which make up the seat's cushioning are naturally deodorant, and are able to wick away moisture from the surface. The seat pad and harness covers can be removed for easy cleaning. This seat does command a high-end price - not the most expensive on this list, but certainly not a budget buy. With a choice of 11 different colors, free returns and 2-3 year optional warranty protection, it justifies its price. The Flex 120 offers the unique feature of being extendable in 4 different directions, creating a long-lasting seat that can grow with your child. It comes with a rigid latch, that can’t be pulled open accidentally, while also offering side-impact protection, an aluminium backrest, and the ability to be folded up for easy transport and storage. Made in Italy, and able to support weights of up to 120lbs. The headrest can adjust to five different vertical positions; the upper backrest adjusts vertically to three positions; the sides can be expanded outwards like wings in three positions, and the seat has five recline positions. The seat employs a blind-lock attaching system where the release latch is hidden from view, and can be tucked down underneath the base. This prevents the latch from being fiddled with by either the child in the seat, or another passenger. This car seat occupies the top end of the market, and benefits from its classy Italian association and design. The price varies slightly depending on your choice of nine colors. 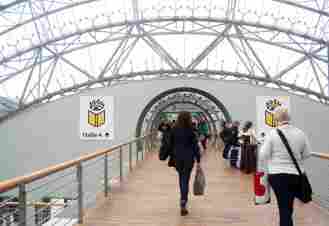 Free returns help take the sting out of an expensive purchase. This seat is a highly adjustable car seat with a plethora of customization options. It uses ReclineSure 9-position levelling technology, which enables the seat to be fitted to a wide range of vehicles. Also comes with a spirit-level indicator for accurate levelling, a 6-position headrest, Latch system, 5-point harness, 2-position chest clip, and even a thermal insulated cup-holder. These bubble-indicators function like spirit-levels, and allow you to be exact in your positioning of the seat. The seat comes with a range of easy-indicators, including extensive and clear labelling of various recline positions. The range of adjustment options on the NextFit are extensive. It comes with a 6-position adjustable headrest, a 5-point harness, a 2-position chest clip, and the shell of the seat itself comes with a 9-position adjustable levelling system, enabling it to fit a range of car and seat sizes. The seat commands a hefty price, but it also supplies the features required to back up the price. There are far too many to list here, but the NextFit handily competes with the other premium seat manufacturers on this list. This compact and lightweight model is a good choice for those who want a reliable car seat without the size and bulk of comparable models. The XRS 65 is compact enough to fit three of them in the back of a typical car. 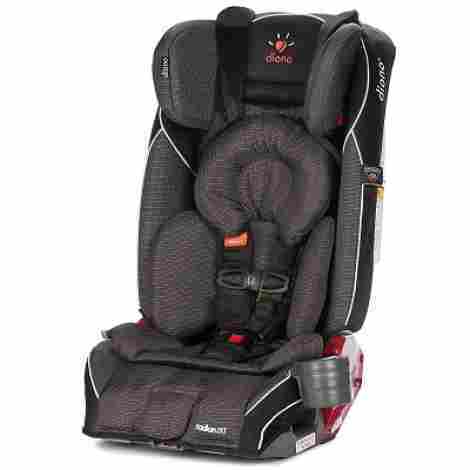 It comes with latch compatibility, as well as a 5-point harness for adjustability as your child grows. Can support weights up to 65lbs and is also side-impact ready. The seat is only 18-inches wide, and presents a manageable weight of just 14lbs. This is almost half the weight of other car seats on this list, and makes a good choice for those who don’t want to be lugging around a 25lbs car seat. As well as coming with a 5-point harness, this seat also comes equipped with an infant insert for use by younger kids. If using this option from a young age, this gives you an extra few months use from the car seat. The seat falls somewhere in between the most and least expensive items on this list. It’s an affordable product which is rated highly, even if it lacks the extensive features of the more expensive items in this review. 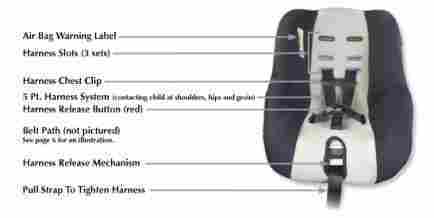 This high-end car seat from Diono comes with a huge arsenal of useful features which justify its premium reputation. Even though it weighs 27lbs, it is constructed in a slim manner, allowing three of the seats to be installed in the back of a typical car. 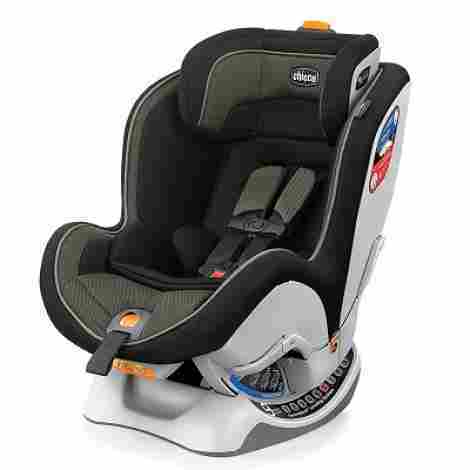 It also comes with energy absorbing foam, multiple harness adjustability options, latch-ready attachments, and the inner fabrics of the seat can be removed and machine washed. The seat is reinforced by a steel frame which runs up the length of the structure. The side walls are reinforced by aluminium and are also packed with energy absorbing EPS foam. It also includes Safe Stop harnesses, which are grooved to provide a more gradual, but secure stop. The seat can be folded up for easy transport, while the adjustability options cater for children up to 120lbs - if used as a booster seat along with your car’s own seat-belts. This seat comes from a reputable, established company on the premium end of the car seat market. As such this model commands a high price, but with an expected 10 year life span, coupled with an optional 3 year warranty, the RXT probably justifies its price overall. As you can see, there are a lot of criteria to be considered when choosing a reliable convertible car seat. Some models offer compact designs while sacrificing features; while others come stacked full of unique and useful features but pay for it in being heavy, bulky and pricy. Some are built with convenience in mind, with easy-carry options and machine-washable fabrics, while others concentrate on offering the basic safety options you’d expect from a good car seat. Ultimately, every car seat in this review has been crash-tested for multi-directional impacts and each one is approved to Federal standards. A convertible car seat for your child is not a luxury purchase; it’s an essential one. WIth that said, your child can still feel the luxury of a memory-foam padded cushion, or self-wicking, self-deodorizing fabrics; or the recliner and extendibility of a premium car seat, without sacrificing safety. The car seats presented in this review are all good choices, and there should be enough variety of options here for even the most discerning buyer. Sometimes, It can be difficult for parents to know when they should switch their child from a car seat to a booster seat. General guidelines tell us that it is safe to switch a child into a booster when two key requirements are met. First, your child needs to be at least four years of age. Second, they must also be too tall to fit in a car seat or weigh at least 40 pounds. For some parents, this means that as soon as their child turns four years old, they are switching them from a car seat to a booster seat. Do not do this. By far, keeping your child in a car seat is the best way to keep them safe when driving, but this is only as long as they fit. It is only when a child is at least 4 years old and either weigh 40 pounds or more or is too tall for their car seat that they should be taken out and put into a booster. A child is too tall when their shoulders rise above where the strap slots are located. Keep in mind that you may need to double check with specific laws on car seats and boosters in your state because some states have particular regulations. Many people don’t know this, but there’s actually a lot to learn about booster seats and booster seat safety. Making sure that your child is old enough and big enough to fit properly and safely into a booster seat is your first priority when it comes to this car seat device. Once you are sure that your child is ready for a booster seat, you naturally need to know how to properly install it. Each booster seat is different, so you’ll need to read the manual that comes with your product. In addition, some parents think that because their children are ready for a booster seat, they can sit in the front seat of the car. This is not true. Children who are four years of age or older are ready for booster seats if they weight over 40 pounds or are too tall for a traditional convertible car seat. But they still must sit in the back seat of the car. They cannot sit in the front seat, or they risk decapitation from an airbag in the event of a collision. In fact, children need to stay in the back seat of the car up until the age of 13 in most cases. Boosters in the back seat help transition children from car seats to sitting regularly with a seatbelt. 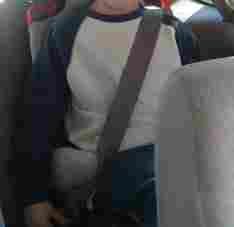 Children using booster seats do use seat belts, but they are raised high enough so that the safety belt hits them on bony areas of the body like the hips and shoulders. This is the safe way to have a seatbelt on. One last thing to know about booster seats is that when you are looking to purchase one, you will have the choice between a high back booster. You will learn more about high back boosters and backless boosters in the following sections. High back booster seats are very similar to regular car seats for children, and that’s why a lot of parents like them. Their main purpose is not to strap the child in with the straps that come only from the seat but with the actual seat belt that is in the car. The seat itself does not even hook into the car. Instead, the seat belt holds the child back. Many parents and caretakers who prefer the high back booster seats to backless booster seats have cars that have low seats or those that don’t have back seat headrests. In these cases, the high back protects the child’s neck and head while driving. 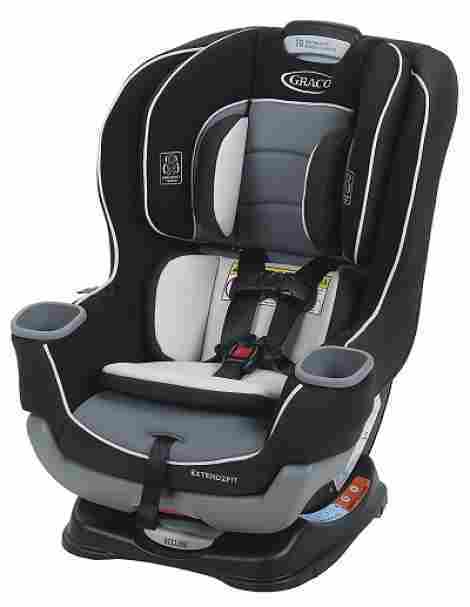 As you may have read in Graco Affix reviews, high back booster seats are also recommended by some child and safety experts because they incorporate the car’s seat belt into the booster itself. This is unlike the backless booster that simply sits on the back seat of the car. There are strap slots in the back of high back booster seats that the seat belt from the car can be guided through for better safety and support. These slots also help guide the safety belt so that it hits the proper areas of the child’s body. One downside to this booster seat model is that children often find it cumbersome the older they get. In some ways, the backless booster makes them feel older as they grow and restrains them less. These seats can also be difficult to transport if you’re planning to move them from car to car on a regular basis between uses. I wanted to give you what I feel is the best high back booster seat on the market. It’s called the Maxi Cosi Rodi AP Booster Car Seat, and it can be found here on Amazon. You can get it in total black, steel grey or origami rose. If high back booster seats are something you’re looking to learn more about, please also consider reading my comprehensive guide on these seats in which I go into detail on several of the top models on the market. Backless booster seats are just what they sound like! They are similar to a booster seat that you might use at the dinner table at home for your child. This product has no back, but it is simply a comfortable seat that hooks to the bottom of a back car seat. In addition, they often have armrests on either side for the child. Backless booster units are especially suitable for cars that have headrests that might otherwise interfere with the top of a high back booster. Smaller cars tend to take them better. In addition, they are smaller in overall size, so if you need to switch boosters from car to car, this may be the booster model for you. One con of using these is that they offer no shade from the sun so you might want to consider buying a seat mirror to block out the sunlight. Advocates of the backless booster model like that it is smaller and lighter weight. They also say that the backless models help transition children much better from car seats to regular seating without a seat or booster. On the other hand, some parents and caretakers do not like this type of booster seat for children because it does not incorporate a back and therefore does not have slots where the car’s seat belt can be guided into better fit around the child. In my opinion, the best backless booster seat on the market right now is the Evenflo Amp Performance No Back Booster Car Seat, which can be found here on Amazon. Get this backless booster in either red, green, blue or pink. It is a great seat that always gets great reviews on Amazon. People love it. It is also extremely inexpensive as far as booster seats go. If you would like to learn more about backless boosters and how to choose the best of these seats for your child, you should also read our comprehensive guide on high back boosters found here. In addition to high back booster seats and backless models, there are also combination booster seats. Combination seats are forward facing car seats that actually grow along with your children. In this way, they are both car seats for young children and booster seats for the same children as they get bigger and require different seating in the car. Most of these types of seats have a 5-point internal harness. When the seat is being used as a car seat, the harness holds the child in, and later, you can turn the seat into a booster. As the child gets older and taller, the back of the seat on combination seats moves up, or you may choose to remove the back entirely and create a backless booster if that’s what you prefer. These combination seats are actually the perfect choice for parents who want to be able to transfer the booster to and from multiple cars. They are also great because they allow you to save money on buying entirely new seats for your children. Remember not to confuse combination seats with convertible car seats. They are not the same thing, and combination seats cannot be faced to the rear of the car. Multi mode seats present the epitome of the changeable and convertible car seat for children. These seats can function as car seats for small children and booster seats for older children, and in addition, they can face the front or the rear. Many people think that this is the seat for them when searching for car safety equipment, but there are definitely some other things to keep in mind here. First of all, these seats seem pretty amazing, and some of them are, but for that reason, they can be rather expensive. In addition, because of all the changes, they are expected to make, arranging, adjusting and maneuvering these beasts can be a challenge. Finally, some experts say that because of the multi-featured nature of these seats, it is not definite that each function is at its best on multimode seats. In other words, sometimes a seat that was made to be a rear-facing car seat for infants and is only to be used for that purpose is better than one that needs to fit many different situations as is the case with the multi-mode model. Are car seat covers safe? I get this question a lot. First of all, let’s talk about what exactly a car cover is. There is such a thing called a car seat cover or a car seat canopy as many people describe them. These are very popular devices that it seems almost all babies have on their car seats, and this is especially true in cold climates. The car seat covers are designed to protect the child and keep them warm. They can also shield babies against the elements like rain and snow when they are going back and forth in and out of your vehicle. But this brings to question whether or not these devices are truly safe for babies. Certainly, if a mom or dad is definitely going to want to cover the car seat as they carry it, a professionally made car cover is better than simply popping a blanket over the top and trying to hold on to the handle of the car seat at the same time. Actual car seat covers are handy in this regard because they have a hole where the hand of the seat can go through and you can hold on tightly. It is equally important to keep your baby warm during the cold autumn and winter months, and this, a car seat cover can do very well. The worry that most experts agree on, however, is that when a baby is covered like this, it is possible for them to essentially rebreathe their own carbon dioxide. Many professionals think this could lead to SIDs. And unfortunately, it is a silent process. Not being able to see your child through the cover means that you don’t know if they are truly alright or not. There is also the worry of positional asphyxiation, which can occur if your baby’s head is tilted up too far so that the airway is cut off. With a car seat cover on, you would not be able to see this until it was too late. The best thing to do is to get a breathable fabric and make sure to check on your baby often through the cover or canopy. When you have a small car, you need to make special accommodations for the accessories that you buy for your car. And this is especially true when it comes to purchasing convertible car seats for compact cars. 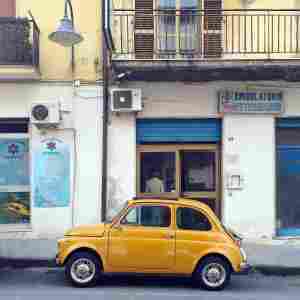 Having a small car can be convenient and great for the environment, but it also means downsizing. Unfortunately, convertible car seats can be giant in many cases. They can be bulky and heavy, and they can almost literally take up all of the free space that you would otherwise have in your back seat. This might become so much of a problem that you can’t have anyone else sit there. To remedy this conundrum, those with small children and small cars need to find the perfect compact car seats. Don’t worry, we’ve got you covered. 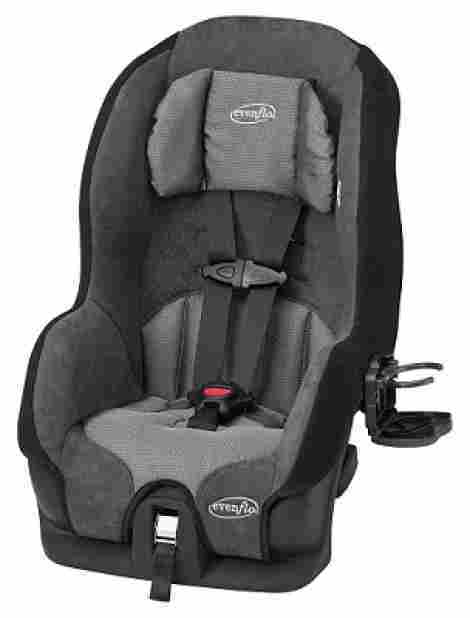 Find a comprehensive review of the best INFANT car seats for small cars on this page. There are a number of key benefits to buying a convertible car seat for a small car. For example, these seats tend to be more compact and therefore lighter weight. This makes it super easy to transport just the seat or the seat along with your child to and from the car. Some parents who share a car seat between a few vehicles can truly benefit from a lightweight car seat that is also compact. In addition, having the smallest convertible car seat possible is going to enable you to have a lot more storage space in your small car. This is important for a lot of folks who need to cart around luggage, groceries or other items on a regular basis. Finally, if you have additional children or members of the family who need to be able to sit in the back seat, you will definitely need a compact convertible car seat for a small car so that you can fit the others in the back. Keep in mind that children who are smaller absolutely have to sit in the back seat because it can be dangerous to sit in the front seat where there are airbags that could harm them if deployed. Even the ability to transport friends or other family members in the back seat while not having to remove your car seat just for the extra space will come in handy! When it comes to purchasing a convertible car seat for a small car, things can get confusing. There are so many things to consider, including what your seat will look like, how it will function, how safe it will be and how your child will like it. The choices are endless when you start shopping around for these seats online. So let’s help you get a few things straight with a much-needed frequently asked questions section. 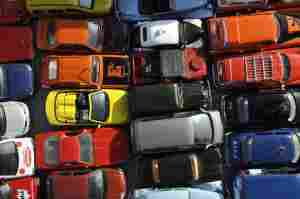 Q: Are smaller car seats for compact cars as safe as larger car seats? Yes. There is no need to worry about the safety of smaller or lighter weight car seats for smaller cars. These seats simply tend not to have as many bells and whistles as the other car seats. This makes them smaller. For example, they might not have the extra cup holders on the side or the extra winged sides. This doesn’t mean they are any less safe. Most of the durability and overall safety has to do with the seat being buckled in tightly to the entire back seat and LATCH system. So if you can do this properly, your child can definitely be safe in a lighter weight and smaller car seat. Q: What if a child’s feet touch the back of the seat in their car seat because the car is smaller overall? The sight of a child’s feet touching the back of the seat when they are in their car seat may be slightly alarming for some parents to see. This is because you might initially imagine that in the event of a crash, the child’s feet will jam against the seat. Actually, there is no reason to believe this will happen. In crash tests, children who are facing the rear of the car have not had significant injuries to their feet even if they are touching the back seat of the car. On the other hand, children may, in fact, be more likely to suffer feet, leg and ankle injuries if they are facing forward during a crash. Q: How do I safely buckle a newborn baby into a convertible car seat? Newborns are so very fragile that it can be difficult to image not holding onto them while you drive and instead strapping them into their own seat. But putting newborns into a car seat when you drive is definitely the best way to keep them safe. This is even true for preemies. You should never hold your child while driving. Newborn babies need to be strapped into their car seat while it is facing the rear. Again, this is going to ensure that their tiny and fragile necks and heavier heads do not get injured if a crash were to occur while driving. For very small newborns like preemies, it may be important to have an infant-only seat. If you don’t get an infant-only seat, you should put the newborn insert into the seat if there is one. This insert will help keep your tiny little baby snug and safe in their seat. If you are a parent, you understand the importance of your child’s safety. This is of particular significance when it comes to their seating in your car. Making sure you have the best car seat for your child is one of the best things you can do in order to ensure your child’s safety while on the road. However, it is not always an easy decision picking the right seat. For example, do you know the difference between front facing and rear facing car seats, as well as which is best for your child? Let us explain the differences to you so that you can make the best choice. The first type of car seats are rear-facing car seats, meaning the child faces the back of the car. While you might think this seems strange or less safe, it is actually the safest option for children of a certain size. The reasoning behind this type of seat is that should you get into a car accident, the force from the impact is more equally distributed along the car seat and the child’s entire body, instead of the child’s head and neck taking the impact of the force. This type of seat is admittedly a bit more of a hassle when it comes to getting your child into the seat, and it makes it harder to communicate and monitor the child while driving. However, the child’s safety is much more important than any other issue and for this reason, a rear-facing car seat is the best way to go for your baby. Children under the age of two should absolutely use a rear-facing car seat. At this age, children are still developing and are much more susceptible to injury in the event of a car accident. Specifically, their necks need to be protected and supported. In the event of a front-impact crash, a child in a front facing seat will be propelled forward and will only be restrained at their chest, but their head and neck will snap forward. In a rear-facing seat, the seat itself will absorb the force of the collision. For this reason alone, it is best to keep your child in a rear-facing car seat as long as possible. When children are first born their bones are not fully developed and are still relatively soft. A crash can cause major damage to these bones. That is less likely to happen when the bones are fully formed and hardened. While the absolute minimum requirement is weighing 20 pounds, it is a smart idea to keep your child in a rear-facing seat for longer than that. Every child is different, but most should be able to stay rear facing until they are at least two years old, and for some children, you can comfortably keep them rear facing until they are three or four. Keep in mind that every car seat you will find will have specific height and weight requirements. Many rear-facing car seats will have a maximum weight of 20 pounds. In this case, do not continue using this seat if your child weighs more than that. There are rear-facing convertible seats that will usually support children that weigh up to 30 or 35 pounds. Always check the individual model, however, to see if it will support your child. The other broad category of car seats is front facing car seats, meaning the child is facing towards the front of the car. Children who have outgrown all rear-facing car seats should use the front-facing seats. Children should weigh a minimum of 20 pounds and should be able to pull themselves up. This proves the child is more developed and better equipped to handle being in a car accident facing forward. These seats should still be very secure and feature a full harness that sits across the child’s chest. As is true with rear-facing seats, you also want to check the size requirements for your front facing car seat. Children at this age are growing very quickly and you might find yourself needing to buy a larger model that supports your child’s weight or height. Both rear and front facing car seats should cover the child’s head, so make sure the model you select will accommodate this. Keep in mind that a front facing car seat is different from a booster seat. A booster seat will be a final option for children who have outgrown their front facing seats. Keep your child in a front facing seat until they outgrow the weight and height restrictions of the model you are using. Usually, the weight limit for front facing seats is around 40 pounds, but always check your individual model to be sure. When the child moves to a booster seat, they should stay there until they weigh 80 pounds and are at least 4 foot 9. After that, they may use a regular seat belt in the back seat. Children should not ride in the front seat until they are at least 13 years of age. What types of forward facing seats are there? You may decide you just want to get a forward facing car seat, but there are other options. 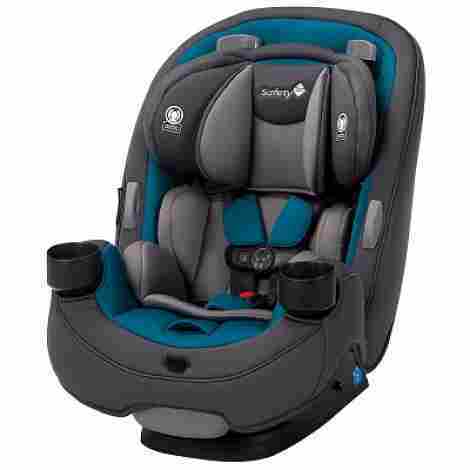 Convertible or 3-in-1 models are very popular these days, as they convert from a car seat to a high back booster seat, to a backless booster seat. While you do not have to buy a convertible model, it is typically a much more convenient option for parents, especially since children are growing so quickly at this age. With a convertible seat, you can use the same seat with your child until they are finally ready to just use a regular seat belt. These seats are just as safe as non-convertible models, although they can tend to be larger and heavier, so traveling with them or moving them between multiple cars can sometimes be a bit of a hassle. LATCH is a popular system for installing car seats. This system is present in your car and is a system of “anchors” that the car seat tethers to. This type of installation system is used in place of using a car’s seat belt to install the car seat. Typically, parents find it easier to install a car seat using LATCH, so this is something you will want to keep in mind when selecting a model. As always, be sure to make completely sure that you are installing the car seat properly, no matter what system you are using. If you are unsure, ask for help before allowing your child to use the seat. Q. Can these seats be used with a stroller? Some car seats are designed to be used with a stroller, while others are not. Often times, parents have to choose between seats that are convertible and seats that can be easily removed and used with a stroller. If you are traveling a lot and frequently use a stroller, then it is probably most convenient for you to get a car seat that is easily removable and used with a stroller attachment. If most of your travel takes place in your car, you might find a convertible car seat that stays in the car is a better option for you. Your lifestyle will oftentimes be the deciding factor for these decisions. Thankfully, with so many options to choose from today, you will be able to find a seat that will work best for you and your child. Q. Can multiple children fit in the back seat with car seats? If you have multiple children, it is a common question to know if you will be able to travel with them all in your car. The truth is, all children younger than 13 years of age should sit in the back of your car. However, car seats tend to be fairly bulky and you might find that you cannot fit two car seats and another child in the back of your car. If it is at all possible, try to either find smaller car seats that will make more space, or consider getting a larger car that has two rows of back seats. If a child has to ride in the front seat in an absolute emergency, place a child in a car seat in the front seat with the seat pushed far back (in order to avoid the danger of the airbag going off and injuring the child). However, this should only take place in an emergency. Q. What is the best forward facing seat for long road trips? For long road trips, you want a seat that is going to be comfortable, safe, and can also provide some amount of storage for drinks, snacks, and toys. Look for seats that have good padding, full impact protection, and cup holders. Q. What is the best one for flying? Most importantly, you have to keep in mind that car seats that you take on airplanes have to be FAA approved. There will be a label printed somewhere on the seat that will read “This restraint is certified for use in motor vehicles and aircraft.” This is the most important thing to keep in mind, although you may also wish to select a seat that is lightweight. You will have to carry this seat through the airport, so it is in your best interest to select a seat that is not overly bulky. Q. What is the best one for sleeping? If you are hoping your child will fall asleep while riding in the car (or on an airplane), look for seats that have a lot of padding and have an adjustable headrest. This headrest can adjust to your child’s height and can help them sleep better. Also, consider a seat that has a recline option that will make the seat even more comfortable. Q. What is the best forward facing seat for small cars? If you have a compact car, you will need a seat that is as narrow as possible without sacrificing safety. Additional features added to the car seat may make it bulkier, so consider more streamlined seats that will fit into smaller spaces. Q. When can a child start using one? It is common knowledge now that children are safer in rear-facing seats, and therefore they should stay there for as long as possible. As a minimum, you should keep children rear facing until they are 1 years old and weigh 20 pounds. However, many rear-facing seats have weight limits higher than this, and it is smart to keep your child rear facing until they reach the maximum weight limit, on average around 40 pounds. Q. How long should a child be using a forward facing seat? Children should use forward facing seats until they are able to just use a regular seat belt. It is recommended that children do not stop using a forward-facing seat until they are at least 4 foot 9 inches tall. This will differ for every child, but will typically occur when they are around 10 years old. However, their height is a much more important factor than their age. Children should remain in their booster seat until they reach the proper height limit. They should still remain in the back seat using a regular seat belt until they are 13 years of age. Not only do you need to make the right decision regarding the type of car seat, you also need to make sure you are installing it correctly. If you are unsure how to install your car seat, make sure to ask for help or consult a manual before allowing your child to ride in it. Make sure to use either your seatbelt or LATCH system to make sure the seat is securely in place with no more than one inch of movement at the base of the seat. This will be just as important as selecting the right type of seat. Making decisions regarding the safety of your child is the most important thing you will do as a parent. When it comes to car seats, make the right decision based on the height and weight of your child. Do not worry as much about age, as all children grow at different rates. If at all possible, keep your child rear facing as long as possible by buying models that allow for a maximum weight of 35 pounds. Once your child has outgrown this limit, you may switch them to a front-facing seat. Keep them here until they are big enough to ride safely with a seat belt. How do you Clean a Car Seat? It is important to keep your child’s car seat clean and sanitary. This is for safety reasons, but it is also because car seats that have food or other stains on them can begin to smell and become unsanitary. You don’t want to have to smell that in your care while you drive, and you don’t want your child to be sitting in filth either. 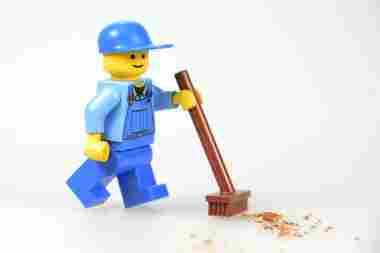 Everything in the back of the car such as toys should be cleaned and sanitized often to avoid exposing your kid to possible bacteria. To clean a car seat, first, remove the straps. These can be washed in the washing machine along with the seat cover. To remove the seat cover, you will need to take off the strap hole prongs. There are usually four or more of these, and you may need a pair of pliers to get them out. Once they’re off, you should be able to pull the cloth seat cover off and throw it in the washing machine. Keep in mind that each car seat is different, so it is possible that this procedure may vary from seat to seat. Always follow the instructions given to you by the manufacturer. A video tutorial showing how to remove the straps, strap prongs and seat cover for washing can be seen here. What is a Belt-Positioning Booster Seat? Belt-positioning booster seats are for those children who have a height and weight above the limit for normal forward facing seats but who may not fit an adult vehicle seat belt yet. Typically speaking, most vehicle seat belts will not fit until children are around 8, 9, 10 or 11 years of age. Children usually need to be at least 4 feet and 9 inches before they will fit adult seat belts in cars. The belt-positioning booster seat lifts the child up so that they can use the seat belt that is already in the car, but then the seat also has a way to adjust the seat belt so that it hits the child’s body on key places that are rather bony and would be strong against a collision if that were to occur. These areas are generally where seat belts hit you if you are in the car. We are talking about the shoulder and hip area. What Is the LATCH System Weight Limit? You may have heard of LATCH, but what does this stand for? Well, it isn’t simply a term referring to latches. LATCH stands for Lower Anchors and Tethers for Children. This is the system that is used in most cars to hook a car seat up to the actual car itself. Remember that for younger children and babies, the actual seat belts in the car are not being used to help the child stay in place. Instead, the seat needs to be anchored to the car so that the straps from the car seat can hold them in. It is important to remember that LATCH is not safe than a seat belt, but in the cases of small children, it is what is used most. Never use LATCH and the seat belt in a car together to safeguard a child. Use one or the other. There are a few car seats that use them together, but this is quite rare. Lower anchors are what you attach the LATCH system to. If you don’t know already, lower anchors are metal bars that are within the seat crack of your vehicle’s seats. These anchors cannot be seen, but there is usually a tag that sticks out to denote the anchors. These anchors have weight limits on them so that you can look to see how much you can attach. Typically, these weight limits will accommodate children in their seats up to 90 pounds, but keep in mind that you must add together the weight of your child and the weight of the car seat itself. Are car seats needed for airplane travel? On airplanes, children, young adults, and adults must all wear their seat belts during turbulence while in flight and during takeoff and landing, so of course, babies and infants must also be strapped in some way during these times to ensure their safety. According to the FAA or Federal Aviation Administration, it is recommended that those babies and infants who are less than 40 pounds have specifically certified infant restraints when they fly. To ensure that your baby seat fits the standards, you should check that the proper FAA label is on the product. What kind of car seats should preemies be in? Preemie babies do not necessarily have specialty car seats made for them, but you can’t find car seats that are appropriate for their small size and weight. When it comes to finding a car seat that will fit your child, the thing that you need to pay attention to most is their weight. If your child is very small but can sit comfortably in a reclined or relaxed position, rear-facing car seats will usually be best for them. You should test comfortable and safe sitting positions with your baby while they are still at the hospital and under a doctor’s care. What do I need to know if my child will be riding in the car with someone else? In some cases, such as for nursery school or childcare, your child may need to ride in a car driven by someone else. If this car is not yours, it is certainly possible that you will need to use a different car seat. In that case, it is up to you to make sure that this seat will fit properly and can be used for the size and age of your child. One thing you can do is check with your childcare provider or school because most of them usually have guidelines that they follow for child transport, and they should have the appropriate seats that you deem necessary for your child. Figuring out where you will buy the best convertible car seat for your children can seem like a rather daunting task. Of course, you want to get the best products on the market, so you may be concerned about where you buy the products that have to do with the safety of your children. While there are some options that can be found at these big box stores, you will inevitably end up having to go to multiple locations to find what you’re looking for. In addition, you may not get the best deals that are out there for car seats. 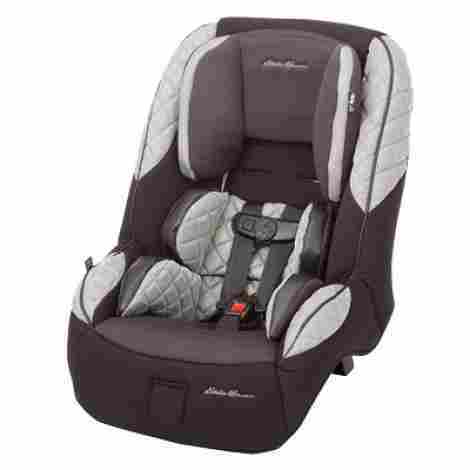 If you really want to find the greatest deals on convertible car seats, the best place to look is on the Internet, and you should specifically look on sites like Amazon who have literally thousands of options when it comes to car seats and other paraphernalia for your babies and children. One nice thing about Amazon is that you have a lot of options, and you will also be able to read the descriptions of each product along with comprehensive reviews from real buyers who have purchased the items you’re looking at and used them. When looking for the safest convertible car seat, you can also get the best deals at Amazon because they always seem to at least match the price of their competitors or have lower prices altogether. Lastly, most of our readers love Amazon because you can get amazing shipping rates and even free options. This means that if you need a new convertible car seat quickly and you don’t have time to read over tons of convertible car seat reviews, you can get it cheaply in only a few days! Figuring out what the best convertible car seat for your child can be a lot of work and very confusing! One search on Amazon for children’s car seats can definitely leave you in a daze. You are probably going to get a lot of advice from friends and relatives as well, and that can make things even more confusing for you. We have gone over a lot in these convertible car seat reviews, so it’s possible that you are feeling a little overwhelmed right now in general. But it’s important not to stress too much about this issue. The bottom line when it comes to purchasing a convertible car seat for your child is that you find one that fits for them. The safest seat for a child is always going to be the one that fits their body the best, fits inside your car well and can be used according to the directions and guidelines in all situations. Keep in mind that every child is different, and every car is different as well. So this means that just because your neighbor has one car seat model, that doesn’t automatically mean that that model will be right for you and your child too. I should also note that if you were looking for the best compact convertible car seat for a small car and you didn’t find a qualifying choice here, you can check my review written specifically with smaller cars in mind here. All in all, I hope you enjoyed reading this lengthy review! I put a lot of time and energy into it, and in addition to all of the research that I did talking to manufacturers, children’s experts and reading online, I also talked to parents themselves. This is because I feel the true test of a car seat is when a parent is able to use it with their kids and see whether it can actually live up to its potential. Thank you for taking the time to stop by and read our reviews, and good luck on your search for the best convertible car seat for your child!